Think about different ways of engaging different people and organisations through social media – since there are different ways of doing it! As always, you should think first about what you want to achieve through social media, in order to make your activity and engagement meaningful. The most important aspect of social media is that it’s just that – social. This means that it’s about more than simply broadcasting your messages, notices, opinions, etc – it’s also about listening to others. Some would argue you should listen first, and speak later. This aspect fundamentally shapes how people use social media – people expect you to engage with them. The video below has useful thoughts from Dan in BCB (Bradford) on using social media as a two-way tool for listening. Social media can reinforce and promote the work that you already do with other people and organisations – demonstrating your social capital. 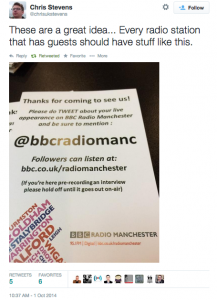 The example below shows use of Twitter by @BangRadio to connect with (and also, show their connection with) an organisation. Doing this makes your work visible to others, with the possibility of a retweet by that organisation (& possible further exposure). Note also the familiar tone of the response. It’s worth pointing out that tweets like this indicate an already established connection, and familiarity and mutual respect for each other’s work – this tone may not be useful or appropriate for early-stage or not-yet-active partnerships or collaborations. It hardly needs saying to a media organisation that the key to getting engagement is to hone your message and to think about what the audience is interested in! Your audience on each social media platform will be different from each other, as well as from the listenership of your station. Therefore, on one social media platform, you may get more interest and engagement from posting more official content about your station and what it does in the community, while on another platform, behind the scenes photos of volunteers might be more popular. This is something that you can probably only find out through experience and experimenting – making use of evaluation tools. You can also monitor engagement on an ongoing basis, tracking who likes, comments on, or shares your posts. Knowing who your audience is on each platform, as well as what you want to get out of that platform, should help shape what content you post, and also what tone of voice to use (e.g. more/less formal) on a given platform. Many tools now exist that you can use to manage your social media output and presence. This can include scheduling updates (tweets, Facebook posts) to be posted at some point in the future, or on a recurring basis (e.g. 8am every weekday morning, or 7pm in the evening). One useful tool for scheduling posts is Hootsuite, which allows you to manage multiple social media accounts from one dashboard. Hootsuite supports multiple social media profiles, offers analytics, and allows multiple posts to be scheduled at a time. There is a free version, though a number of features are reserved for pro accounts (including the ability to allow the account holder to give access to multiple employees or volunteers without giving out passwords, thereby adding a layer of security and control – a feature called “Hootsuite Teams”). Sign into Hootsuite via Twitter at https://hootsuite.com – once you’re signed up, a walkthrough of key features and functionality is given. With the increasing integration of social media tools – Facebook, Twitter, Audioboo, Youtube, Vine, etc – it is also possible to set up your profiles to transfer content from site to another automatically. However, pushing content automatically to multiple channels may run the risk of putting off people who follow you on more than one channel, so use with care! Below is a video listing four top tools you can use to manage and enhance your social media. Too much information: The sheer volume of social media activity means that it is easy for people to miss your posts amidst the tide of other information they are receiving. Algorithms: Facebook is notorious for continually changing the way in which people see updates in their timelines – which is determined by the mysterious ‘algorithm’. This is a program that monitors what content people like or comment on, what ads they respond to, what links they click, etc. and then adjusts what they will see in the future accordingly. For example, one issue Facebook is trying to address is ‘clickbaiting’ (essentially, teasing people to click your links – see info here: http://www.bbc.co.uk/newsbeat/article/28934479/facebook-is-cracking-down-on-clickbait-in-your-news-feed ). The main take-home point here is that Facebook has the power to change what people see, or don’t see, and that there are no hard and fast rules that you can learn to make your content more visible or prominent. The best approach is to aim to be relevant to your audience, making them more likely to engage with you, and making Facebook more likely to display your content. Time of day, or day of week: There are plenty of guides and analyses on what are the best times or days to post content, or certain types of content (e.g. surveys, articles) – see, e.g. here. However, since every audience is different, this kind of information is usually best comparing to your judgement. If you can, it could be worth trying out similar posts on different days or times of day, and seeing what levels of interaction you get. 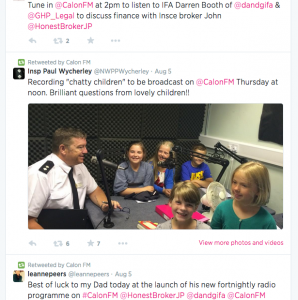 Below is an example of @CalonFM – which promotes the station as friendly, active, engaged, and being a hub of the community with lots of people involved. You can encourage guests and visitors to the station to tweet about their visit by mentioning this to them in person, or by putting up signs of encouragement, as the below example shows. 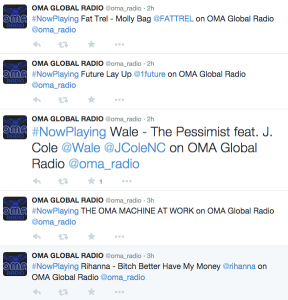 The best community radio social media accounts show clearly the work they do in the community. Some of the examples above show this kind of connection. But a similar use of social media is to signpost and celebrate what’s happening locally – effectively becoming a community news/activity hub. You almost certainly already do this on air, so it’s an idea to echo or even amplify this on social media. 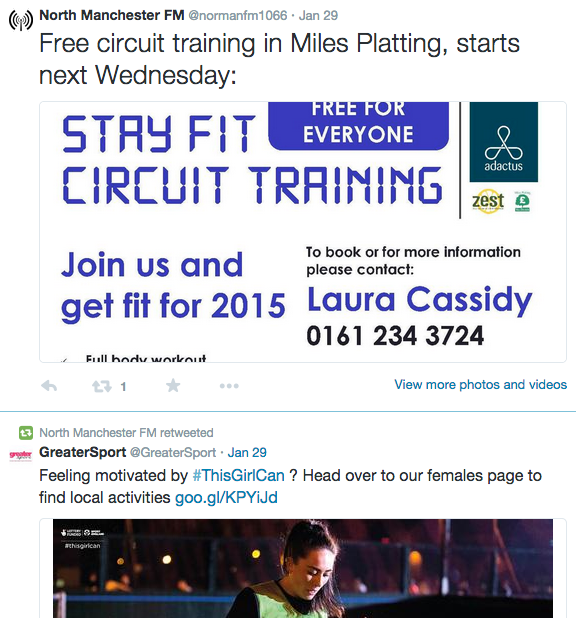 As an example, see the screenshot below from North Manchester FM. Bad splling and grammer: A common bugbear for people on social media is bad spelling and grammar. Granted, some people can take grammar a bit too seriously, but it’s usually a good idea to ensure that posts have correct spelling and grammar, to avoid giving people the chance to turn up their noses at your post before they’ve had a chance to actually absorb your message. Too much of the same: As ever with these things, there is never a hard and fast rule about what is too much and too little social media content. 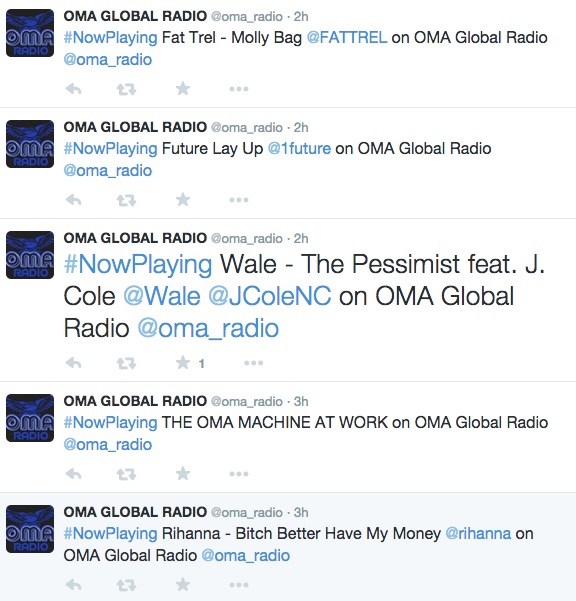 But if your feed is dominated by posts that simply say what song is currently playing on the station, people are likely to switch off (your social media at least) – see the image below showing a run of “#nowplaying” tweets. Tumbleweed: In the opposite corner to the ‘overtweeters’, there are the profiles that haven’t been updated in weeks, months, or even years. Obviously, the main implication of having a dormant social media presence is that people will wonder whether you are active as an organisation, or, even if you are still broadcasting, whether it’s worth their while getting in touch with you. Even if you don’t have time to update Twitter it’s worth scheduling a couple of tweets a week promoting shows or prominent guests. Silence can be deafening. You could use this list to make a mental or actual note of what types of post you tend to use most, and think about whether this fits with what you want to achieve or how you want to present the station through social media. You could instead use the list to think about content that you could post – or you could think of your own categories! Most research and experience points to the most popular content on social media being photos and videos (usually short ones). Some platforms exist solely to share photos or videos (e.g. Pinterest, Instagram, Vine); others, like Facebook and Twitter, handle multimedia in their own way. On Twitter, it’s highly recommended to add a photo directly to the tweet – through the ‘add photo’ button in the tweet composition box (see image). This will show up in your followers’ Twitter feeds, and give your tweet more prominence – it’s therefore a good idea to use a picture which adds value to the tweet, even if the purpose of the tweet isn’t expressly to share a picture. Given the main activity of your radio station is to make radio, it’s also worth sharing audio – again, short snippets are preferable to entire programmes. Audio may not go viral as often as video or photos, but well-made clips can be just as popular, and powerful – e.g. the (playful) ‘UKIP shipping forecast’. We tend to agree with this perspective, – and that a more useful way to approach follower numbers (as well as engagement numbers), is to value quality over quantity. Forging and strengthening a deep connection with your social media community is probably a more productive objective – and may well pay off in the long term, when it comes to fundraisers, partnerships, etc. Having said that, it’s ok to request once in a while that people share or retweet your posts, as it can help to spread the word on a campaign, or raise awareness of an initiative. It doesn’t take much to share something, so a clearly constructed post (including a link and/or photo) with a clear ask (i.e. to retweet) can have a payoff in the short term. Use social media management tools (like Hootsuite, Tweetdeck, Klout) to schedule updates, keep up with multiple feeds, and track your organisation’s social media influence. Facebook has an inbuilt scheduling functionality – click the clock in the update box.